Nearly two years after an abandoned warehouse in Pointe-Saint-Charles was taken over by residents for a major makeover, the building is now open to the public. Nearly two years after an old warehouse in Pointe-Saint-Charles was taken over by residents for a major makeover, the building is now open to the public. "I'm super impressed," said Pointe-Saint-Charles resident Giorgia Therriault. "It's going to create that sense of a community space … somewhere for people to come and gather and meet their neighbours. I think it's something that was missing from the neighbourhood." There's still lots of work to do, but phase one of the construction work, which covers 1,850 square metres, is almost complete. 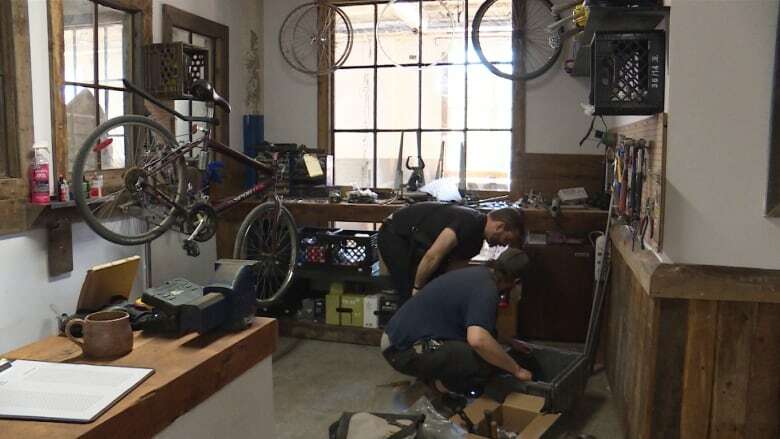 Once finished, the space will feature a grocery store, a microbrewery, a recreation room, an art workshop and a space where people will be able to repair their cars and bikes under the supervision of a professional. "You often have to convince people to come down here. So maybe now it's a little easier," said Waseem Haja, who recently moved to the Pointe. The abandoned building, known as Bâtiment 7, is located on the former grounds of CN Railway in the southern part of the neighbourhood. In 2016, residents got together to save it and turn it into a space for the community. The collective put up a fight against the private sector and won, obtaining $1 million to finance the work. Their goal was address the absence of some very basic services in the neighbourhood. That's why the first phase of the project features a community fridge — and a grocery store is on the way. "About a quarter of the area we had to develop around proximity services and emergencies we had to solve in the neighbourhood, especially given there are no grocery stores around," said Bâtiment 7 collective member Kevin McMahon. There's still another 6,500 square metres to renovate, and among other projects, the collective wants to provide more access health care services. McMahon said they are all working on creating a family and health hub in phase two. "A daycare, maybe a birthing centre, an alternative medicine co-op, and we also want to put together for the third phase a community food hub, where we'll have an education and urban barn where we want to grow food and have animals," McMahon said. "For us, it's about going back to basics — the basics of human relationships and feeling and being part of a family."